For aspirants eager to progress on the spiritual path, one of the most valuable tools is the mantra (sacred name to be chanted). For the mantra to be effective, one should receive it from a Self-Realised Master. Traditionally, disciples had to undergo extensive trials before they were allowed to receive a mantra. However, out of Her Universal Love and Compassion, Amma gives mantra initiation almost always when She is asked to do so. Over the years Amma has been giving hundreds of mantra initiations every week, whether it is in Amritapuri or elsewhere. When Amma gives mantra initiation, She asks nothing for Herself. She asks only that the mantra recipient commit to a life of service and love, with faith in God. She never tries to convert anyone but leads each one according to his or her faith and belief system. 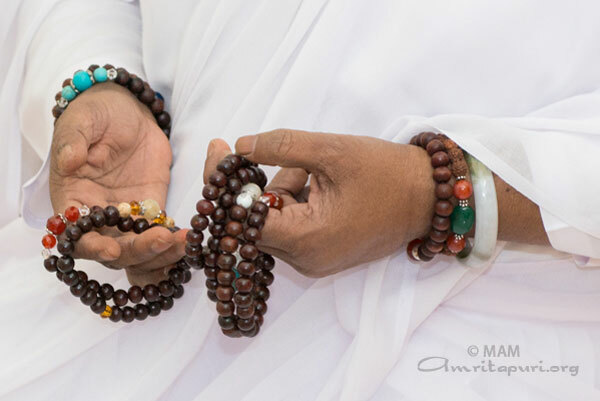 Hindus, Muslims, Buddhists, Christians, Jews and even athiest, all ask for mantras from Amma. She gives each one a mantra corresponding to his or her faith. She helps each one to find and practice the essential principles of his or her own path. About the mantra, Amma says “When Amma gives you a mantra, She sows a seed of spirituality within you. She transmits a part of Herself into your heart. But you have to nurture that seed by meditating, praying, and chanting your mantra regularly, without fail. You have to be totally committed. “The natural way to get yoghurt is by adding a spoonful of yoghurt to warm milk. Having added the culture, you let it stand for some time, and thus, all the milk is transformed into yoghurt.